This weekend was all about the Goodwood Festival of Speed. It was a fairly sunny weekend over in the UK and quite a few records being broken at the famous hill climb. The event was attended by automotive enthusiasts in the hoards and as is expected with these events, the center of attention were the supercars. Among the Paganis, Koenigseggs and Lamborghinis was a very special Ferrari. 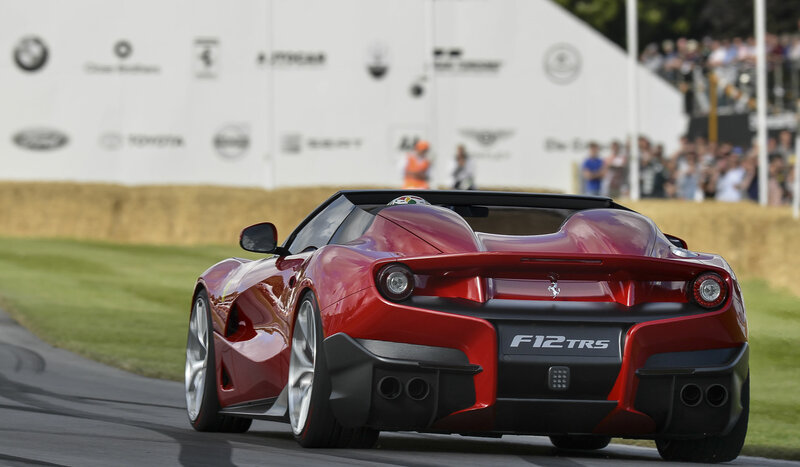 Built by the special projects division at Ferrari, the F12 TRS is a one-off commissioned by a wealthy collector. It is based on the Ferrari F12 Berlinetta but is completely redesigned on the outside. Some of the highlights of the design include the reworked rear buttresses, barchetta style roof line and wraparound glass and a Corvette ZR1-like engine cover with a small glass surface allowing the gorgeous Ferrari V12 peek through. Shmee150 got a rare chance to shoot a walkaround video with the 4.2 million dollar Ferrari F12 TRS and it is something you wouldn’t want to miss.